Turkish Dogs - particularly Anatolian Shepherd Dogs: The Sims 2 - Pets are coming! UPDATE: Friday, July 21, 2006 - It's OFFICIAL! Preorder The Sims 2 Pets at the EA Store! Oh, my goodness! I am really excited about this! 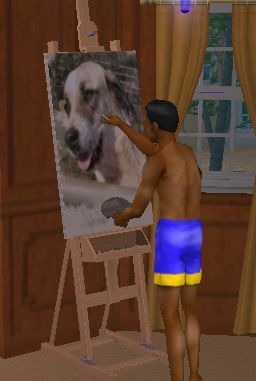 Up until now, my Sims in The Sims 2 have only been able to paint their pet Anatolians or other critters -- and unlike the Sims in the previous version, they couldn't actually own any. Well, thanks to a brief Sims 2 =teaser= in the midst of a much longer EA games feature clip which was shown at E3 2006, it became apparent last week -- that pets really are at least in the drawing stages for The Sims 2! I know pet lovers who play Sims are pretty excited about this. The Pets feature from the EA presentation has been very briefly and cautiously expanded on by many Sims 2 fans that were lucky enough to go and see E3. 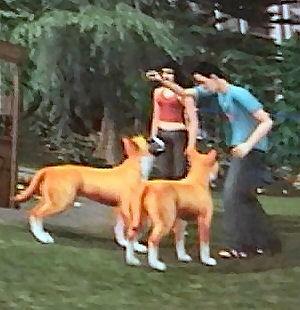 The BIG news for me is that it seems definite that The Sims 2 will be having Pets! As of now, there really is no official word on it. Ah the suspense! TheSidDog Machinima: E3 2006 Coverage, Day 1 - The Sims 2: Pets. I've never been much of a computer gamer aside from the occasional solitaire, tetris or mahjongg game, but when the original series of The Sims was out, my interest in the world of Sims was piqued when I saw an expansion pack called "The Sims Unleashed" on Amazon.com. 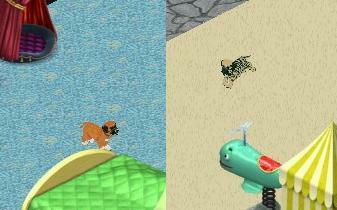 I then found the cutest little pictures showing pet dogs and cats from the game. I still had no idea what the game was about then, nor even what the hey an expansion pack was -- but nevermind I still wanted to experience some of that! Thus I got my start on the The Sims via Unleashed. So much fun. The collection of breeds didn't include Anatolians, but I recolored a few pups so I'd have a flashy red fawn, a regular =and= a white brindle, as well as classic yellow fawn. It turned out that I had arrived on the Sims scene just as a new series called The Sims 2 was being released. Essential game elements are similar but there are way better graphics, beautiful 3D animation AND you really need a great graphics card, plenty of memory and a fast CPU for The Sims 2. 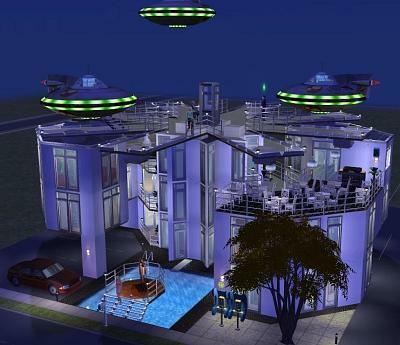 "The Sims 2" is a beautiful, flexible and creative game, and for many people who can find the time, rather "addictive". You can direct, build and challenge yourself in so many ways. You don't even have to play the game per se if you like building beautiful, strange or futuristic houses that Sims (and their pets) could live in or perhaps you like creating fashionable Sim people with custom clothing designs. I'm sure I'm going to have the Pets version and will be finding some way to make some of my Sim doggies as Anatolian. UPDATE: 17 July 2006 - Apparently there is going to be a sort Sim pet Generator or "Create A Pet" option where certain types of premade breeds of different species will be selectable to combine into customized pets. See ongoing specific pet related updates and pics at SnootySims.com Pet page. It may be easier to make my own Anatolian Shepherd Dog (and other pets) than I previously imagined! UPDATE: 30 Sep 2007 - This page gets a lot of hits for the SpacePort by SimMaster Ralph. Those readers who would like a Captain Jack Sparrow download good for any installed game of The Sims 2 might be interested in my other Sims 2 postings for other comments and downloads, also listed below as a 'label'.